This came right on the heels of a U.A.E. court sentencing Qatari doctor Mahmoud al-Jaidah to seven years in prison on Monday, for the crime of aiding a banned opposition group called al-Islah, which the U.A.E. government alleges has operational ties to the Muslim Brotherhood. This was a coordinated move, led by the Saudis, to punish Qatar for supporting Muslim Brotherhood interests around the Middle East (and also for assuming a more prominent role in pan-Arab politics in general), but beyond that it reflects the Saudis’ deep and ongoing concern about an Iranian resurgence in the Gulf. From the Saudi perspective the Qataris have been punching above their proper weight, and making nice with the wrong people. Qatar’s ties to the Muslim Brotherhood are clearly the public justification for this row; it is no mystery why Saudi Arabia followed up Wednesday’s diplomatic swipe at Qatar with a decision on Friday to declare the Muslim Brotherhood a terrorist organisation. The Saudis, while they share certain conservative Islamic principles with the Brotherhood, are more than a bit put off by the group’s opposition to dynastic rule. Despite that feature of Brotherhood’s ideology, though, the very dynastic Qatari monarchy has been a strong supporter of Brotherhood-allied movements throughout the Middle East and North Africa, in Tunisia, Libya, Egypt (especially), and Syria. Their rationale for doing so has been two-fold: one, they feel that supporting the Brotherhood abroad should insulate them from the Brotherhood at home, and two, Qatar has been predicting that the Brotherhood would be the main beneficiary of the Arab Spring. Had they been right in their prediction, Qatar’s regional influence would have been significantly increased as a result, but by the looks of things, they were wrong. The Brotherhood’s Freedom and Justice Party is now outlawed in Egypt, its Ennahda Party in Tunisia has voluntarily agreed to give up power, and it has lost most of its influence within the Syrian opposition. Last November’s reorganisation of Syrian opposition groups from the Qatar-financed Syrian Islamic Liberation Front to the Saudi-backed Islamic Front can be seen as evidence of the Brotherhood’s, and thus Qatar’s, loss of stature. A related complaint that these countries have with Qatar is with the country’s Al Jazeera television news network (the “hostile media”). Al Jazeera has continued to provide media access to Muslim Brotherhood figures in Egypt even as that organization was outlawed by the interim Egyptian government, to the extent that several Al Jazeera journalists are currently on trial in Egypt for aiding the Brotherhood. The reported pressure being placed on Saudi and Emirati journalists working in Qatar to quit their jobs and return home undoubtedly has something to do with the overall irritation with Qatari media. However, there is another factor at play here: Qatar’s close – too close for Saudi comfort – ties with Iran (the real “organisation” that threatens Gulf – i.e., Saudi – security), which has to do largely with natural gas. 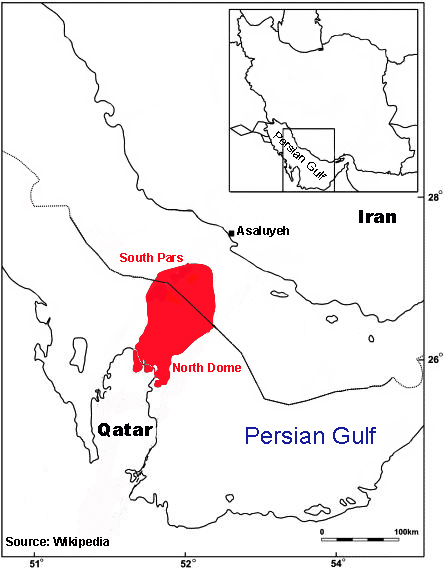 Qatar shares its windfall natural gas reserves with Iran, in what’s known as the North Dome/South Pars Field in the Persian Gulf. The International Energy Agency estimates that it is the largest natural gas field on the planet. Qatar has been extracting gas from its side of the field considerably faster than Iran has been, for a couple of reasons. For one thing, the North Dome side of the field (the part in Qatari waters) was discovered in the early 1970s, whereas the South Pars side was only discovered about 20 years later, so Qatar had a lot of time to get a head start on developing the field. For another thing, the North Dome field is pretty much the only game left in Qatar, whose Dukhan oil field is clearly on the decline. Qatar has a huge incentive, then, to develop as much of the North Dome as they can as fast as they can in order to fund their numerous development projects. There is a potential conflict here, though. Natural gas, like any other gas, tends to flow toward areas of low pressure. So when one end of a gas field is being drained of its gas faster than the other end, some of the gas in the less exploited end may flow to the more exploited end. This is fine when an entire field is controlled by one country, but in this case, one can easily envision a scenario in which, several years from now, the Iranian government is accusing Qatar of siphoning off its gas. What this means is that Qatar has a strong incentive to maintain friendly relations with Iran, and on this they have considerable disagreement with their Saudi neighbors. To Saudi Arabia, Iran is a potential regional rival and must be countered at every turn; their opposition to easing international sanctions against Iran, for example, is not so much about the threat of an Iranian nuclear weapon as it is about fear of Iran escaping from the economic cage in which those sanctions have trapped it. The proxy war taking place between Saudi and Iranian interests in Syria is the most obvious example of the rivalry between the two nations, and the Saudi move against Qatar can be seen as another front in that proxy war. Qatar, although it has backed the Syrian opposition, sees things differently where Iran is concerned; in January, Qatari Foreign Minister Khalid bin Mohammad Al-Attiyah publicly called for an “inclusive” approach to Iran, which he argued “has a crucial role” in ending the crisis in Syria. There is enough historic tension between the Qataris and the Saudis for this kind of disagreement over foreign affairs to provide the basis for a wider fracturing of relations. For its part, Bahrain has every reason to go along with a Saudi diplomatic move against a suspected regional ally of Iran; after all, it was Saudi intervention that saved Bahrain’s ruling al-Khalifa family from a Shiʿa-led rebellion in 2011, a rebellion that Bahrain accuses Iran of fomenting. Look, though, at the two GCC members that did not pull their ambassadors from Qatar: Kuwait, where the Brotherhood’s Hadas Party is out of favour, but whose relations with Iran are “excellent”; and Oman, where Sultan Qaboos has been critical of the Brotherhood, but who is close enough to Iran to have served as a go-between for back-channel U.S.-Iran negotiations. If the issue were really Qatar’s support for the Brotherhood, and not its relationship with Iran, both of these countries may well have joined the others in recalling their ambassadors. The one country for which this explanation does not make sense is the U.A.E., whose relations with Iran are improving after the two countries recently reached an accord over the disposition of three disputed Gulf islands. In this case, it may really be that Qatar’s support for the Brotherhood, and especially the Jaidah case and Qaradawi’s criticisms, motivated their action. Qatar’s failed bet on the Muslim Brotherhood made this the right time for the Saudis to move against them, but Saudi fears about an Iranian resurgence may well have been the real reason for their action.